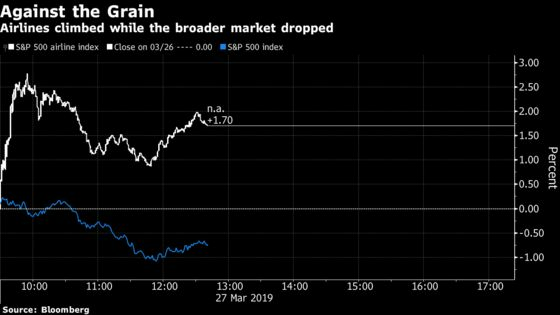 (Bloomberg) -- Southwest Airlines Co., the largest operator of Boeing Co.’s 737 Max, led the industry higher after indicating that the impact from the jet’s grounding would be less than what some investors had anticipated. The ban on Max flights plus soft leisure-travel demand will shave $150 million from first-quarter revenue, Southwest said. In total, the groundings, bad weather and reduced service during labor negotiations will force the cancellation of 9,400 flights from mid-February to the end of the quarter, the airline said in a filing Wednesday. Southwest makes about 4,000 flights daily. The Dallas-based carrier’s comments shed new light on the financial impact of the grounding, which is causing about 130 daily cancellations at Southwest. Parking the planes is boosting operating costs, a critical factor for the discounter, which depends on efficiency to offset low ticket prices. Southwest climbed 1.7 percent to $49.58 at 12:01 p.m. in New York, helping to make airline stocks the fifth-strongest group in a slumping S&P 500. A Standard & Poor’s gauge of the largest U.S. airlines had dropped 1.3 percent this year through Tuesday while the S&P 500 Index advanced 11 percent. The Max has been grounded worldwide since March 13, three days after an Ethiopian Airlines plane crashed, raising concern that the disaster may have been caused by the same errant flight-control software implicated in the loss of a Lion Air jet in October. The accidents killed a total of 346 people. Southwest, which has 34 Max jets in its fleet of 750 aircraft, said it can’t predict the financial impact of the grounding beyond this quarter. It declined to say whether it would seek to recoup grounding-related costs from Boeing. The airline has reduced its flight schedule through April 20 and is evaluating future adjustments. In the U.S., American Airlines Group Inc. and United Continental Holdings Inc. also have the Max. American, which had been making 90 daily flights with the plane before the grounding, said Monday that it couldn’t forecast the related cost. Southwest said that gains in unit revenue, a measure of pricing power, will be limited to 2 to 3 percent from a year earlier, in part citing “further softness in leisure-oriented passenger demand.” The carrier previously forecast an increase of up to 4 percent and said it is seeing “continued strength” in tickets purchased just before travel. Darryl Genovesi, an analyst at Vertical Research Partners, said he expects that some weakness in Southwest’s unit revenue will be offset by flying less. Industrywide, domestic nonpremium fares fell 2.6% in February after a 0.5% drop in January, as airlines lowered prices to lure customers and contend with the effects of the government shutdown, according to a recent report by Ferguson, of Bloomberg Intelligence. Southwest previously said that the shutdown would reduce first-quarter revenue by $60 million. Southwest said that costs for each seat flown a mile, a measure of efficiency, will rise 10 percent, up from the previously estimated 6 percent. The higher volume of cancellations accounts for about 3 points of the adjustment. Some expenses are fixed once schedules are set and aren’t wiped out by scrubbed flights. Labor costs will rise about $30 million from a tentative contract agreement that was recently reached with mechanics. About 3,800 of the quarter’s cancellations were caused by weather, 2,800 by the Max groundings and 2,800 by “unscheduled maintenance disruptions” during talks with the mechanics union, the airline said. That will reduce Southwest’s planned capacity growth this quarter to 1 percent from a year earlier. The airline previously expected as much as 4 percent. Southwest had sued the union, saying that members had engaged in a work slowdown, forcing it to cancel flights and declare an “operational emergency” in five cities where it has maintenance bases. The two sides reached an agreement in principle for a new contract on March 16. As of March 13, Southwest had 41 remaining Max deliveries scheduled this year, with 221 firm orders for the plane.